This elaborate Rococo-revival wallpaper incorporates several different techniques. The print is an applied lithograph, the salmon-color framework is woodblock printed, and the gold is a stamped metal foil. The application of the stamped foil embosses the paper as the foil is being applied, creating a much richer and more reflective surface than a printed gold pigment. 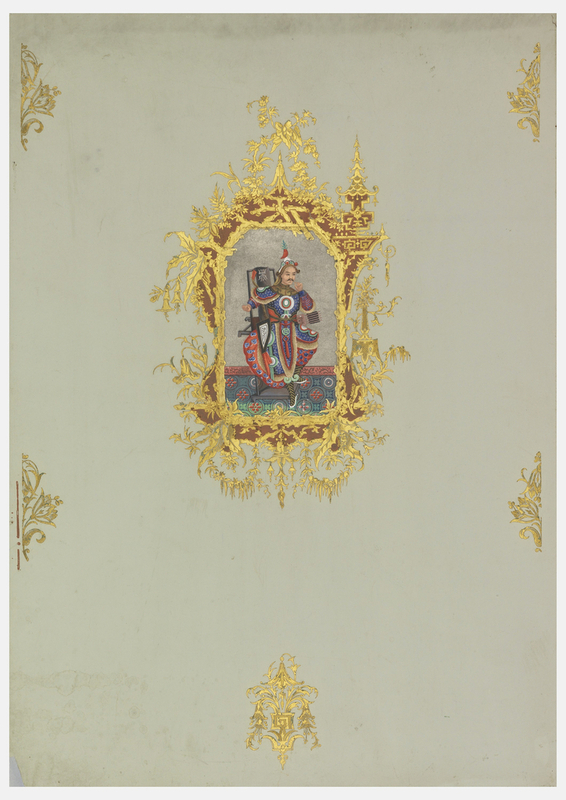 The lithograph image contains a seated emperor or warrior in Eastern ceremonial costume, brightly colored and patterned, enclosed within the printed and stamped foil framework. The asymmetrical frame is composed of a rustic twig structure and contains a pagoda, floral motifs and lambrequins all delicately suspended and made to appear all the more exotic by the embossed gold foil. Wallpapers with very neutral backgrounds painted a light gray or off-white became fashionable at this time and the stamped foil ornament provided a subtle contrast. This lithographed image would change along the length of the roll, creating more visual interest. The combination of different production techniques would definitely increase the cost of production, as well as the time needed to produce. The lithograph printing technique was invented in 1796 and works on the principle that oil and water do not mix. It was this same principle that led to lithography being used to create some of the early washable wallpapers. As the image was printed with an oil-based pigment it created a surface that could be wiped clean, unlike earlier water-based pigments used in the production of wallpaper. Washable wallpapers as we know them today were not developed until 1934. Loved this item and your description. I’d like to make a suggestion: put the date (e.g., ca. 1860) on the first page as well as the link. People who are interested in more detail, as I was, click the link; but key information would be helpful on the first page. No need to respond, I was just making a suggestion.